Israeli officials say they have discovered what may be the oldest Christian Church in the Holy Land - on the site of a maximum security prison. Israel's Antiquities Authority said the church at the Megiddo jail dated back to the third or fourth century AD and was "a once in a lifetime find". 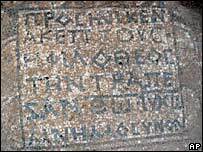 It contained a mosaic bearing the name of Jesus Christ in ancient Greek, fish murals and an altar, officials said. The dig took place near the biblical site of Armageddon in northern Israel. "This is a once in a lifetime find and the inscriptions are very rare," excavation supervisor Jotham Tefer told Israel's Channel Two television. "This is a very ancient structure, maybe the oldest in our area," he said. 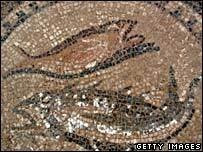 Mr Tefer added that the discovery could help shed new light on an important period of Christianity, which was banned by the Romans until the fourth century. "Normally we have from this period in our region historical evidence from literature, not archaeological evidence," he said. "There is no structure you can compare it to, it is a very unique find." The Vatican's ambassador to Israel, Pietro Sambi, described the find as a "great discovery". According to Christian tradition Megiddo will be the site of Armageddon, the final battle between good and evil on the Day of Judgement.